Gram staining is a special technique which is used to stain bacteria. This technique was developed by Christian Gram in 1884. The stain stain used in Gram staining is called Gram stain. Chemically Gram stain is a weakly alkaline solution of crystal violet or gentian violet. On the basis of cell wall structure and its stain ability wit Gram stain, bacteria are grouped into two categories. They are Gram positive bacteria and Gram negative bacteria. The bacteria remain coloured with Gram staining even after washing with alcohol or acetone. The bacteria do not retain the stain when washed with alcohol or acetone. Outer membrane is absent. Outer membrane is present. Cell wall is 20-30 nm thick. Cell wall is 8-12 nm thick. The wall is smooth The wall is wavy and comes in contact with plasma membrane only at a few loci. The wall contains 70-80% murein. The wall contains 10-20% murein. The lipid content in the wall is very low. The lipid content in the wall is 20-30%. Porin are absent. Porins or hydrophilic channels occur in outer membrane. Cell wall contains teichoic acids. Teichoic acids are absent. Basal body of the flagellum contains two rings. Basal body of the flagellum has four rings. Mesosomes are quite prominent. Mesosomes are less prominent. A few pathogenic bacteria belong to Gram positive group. 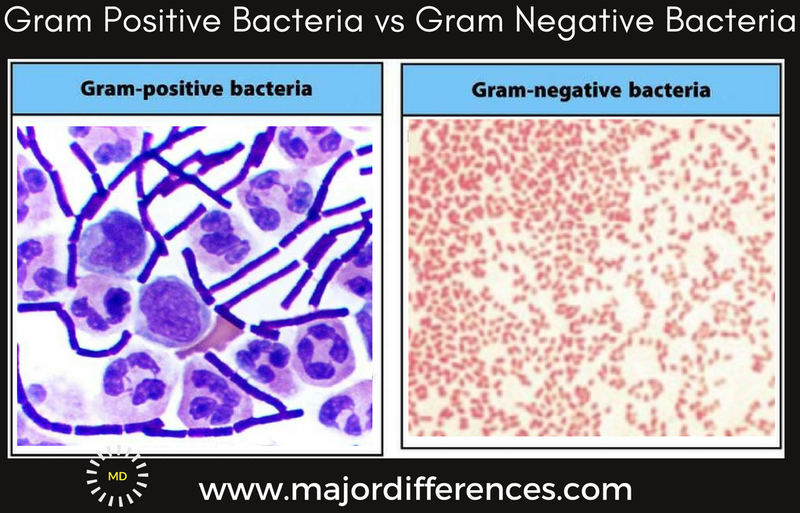 Most of the pathogenic bacteria belong to Gram negative group.